Make the U.S. Coast Guard your first mateThe Small-Boat Seamanship Manual contains all the information found in the Coast Guard's official 1,200-page training manual, giving you access to the highest standards of seamanship practiced and perfected by professional mariners. In addition to in-depth coverage of boat handling and navigation, you'll find instructions for dealing with extreme situations, including search and rescue, towing, firefighting, vessel flood management, righting capsized boats, and maneuvering in heavy surf. You'll also learn aboutSteering with a broken hydraulic line Close-quarters maneuvering Using the right lines and knots Capsize prevention, precautions, and survival techniques Change-of-course maneuvers to reduce icing and freezing spray Plugging and patching holes for flood control Predicting weather And much moreThis is the U.S.
Coast Guard's primary training resource for boat handling and seamanship in conditions ranging from benign to extreme. 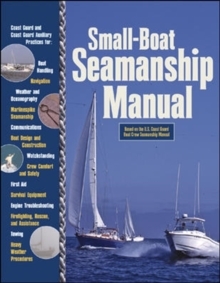 Now this accumulated wisdom is yours with the Small-Boat Seamanship Manual.